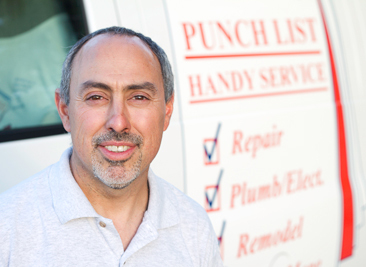 Punch List Handy Service (Rich Valdez) has been working in the handyman service trades for over 20 years, specializing in home repair and 10 years in commercial maintenance. Whether it’s changing a faucet, installing a ceiling fan or work at your office or restaurant, we take pride in every thing we do. Your property and business are a big investment and keeping them well maintained is essential for retaining value and quality of living. Don’t take chances with a company or individual's who don’t have a contractors license. Unlicensed individuals are considered your employees. That means you are required to provide them with workman's compensation insurance. If you do not provide workman's compensation insurance not only are you in violation of the law, you could be held responsible for paying them for the rest of their life should they get hurt. Punch List Handy Service has maintained a great relationship with our customers through honesty, trust, pride, and great workmanship. We treat our customer’s homes with respect and keeping our work area safe and clean is a top priority. With a low minimum charge, and a reasonable hourly rate, you can start checking off your handyman punch list today. We service Albuquerque, Rio Rancho, New Mexico, Santa Rosa, CA. and surrounding area. "Rich Valdez, of Punch List Handy Service has been our choice for fast, efficient, maintenance service for about a year. "....more..